My name is Yamam Nabeel, I am the founder of FC UNITY. 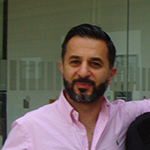 I was born in Iraq and moved to Europe at the age of 4 when my family went into exile, my father was an outspoken critic of the Ba’athist regime of Saddam Hussein in Iraq. I grew up in Hungary, where I started playing football at youth level. We moved to the UK in 1992, where I completed my A-levels and attended university. I worked as a television producer until 2003 when I interviewed the former German coach of the Iraq National football team Bernd Stange. We became friends and I organised The Goodwill UK Tour of the Iraq Team in May 2004. Organising the tour became a full-time job and at the end of it I created FC Unity. FC Unity provides a platform for education and development through large-scale football events organised by a diverse group of locals. It helps people overcome barriers and learn to work together. It brings together the private and public sectors together with the communities in order to empower locals and create healthier communities. My father, who spent his life fighting for freedom and liberty of Iraqis, taught me to always be guided by strong principles. He is still very much my guide and mentor. Q. Where and how did the concept for the FC Unity come about – why is the organisation not funded by professional football in Britain? FC UNITY was born after the success of the Goodiwll UK Tour of the Iraq national team and it came about with the support of Sven Goran Eriksson. 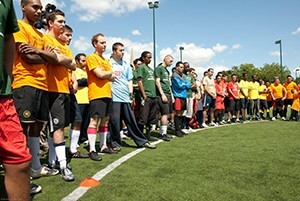 Our first large-scale event was the UNITY Cup London, which was launched in 2007 and became an annual fixture for 7 years. The main concept was a community football tournament organised by a diverse group of young Londoners. It bring London’s various communities together through a series of football events based in the capital organise, managed and hosted by young people. Having dealt with the professional side of football and experienced their agenda, we did not see fit to even attempt to fund FC Unity through them. Q. Can you briefly explain the kind of organisation FC Unity? FC UNITY is a social enterprise, it isa limited company with an internal mission of re-investing any profits back into projects. It’s aim is to create local events, for local people, empowering, developing and employing locals. To date we have hosted programmes in the UK and Iraqi primarily but also in Sudan, Ghana, Somalia and Djibouti. Q. Why do feel the National and International Children’s Football Alliance is a good partnership with FC Unity? WE share the same ethos of grass-roots football and it’s power to be a platform for education and development and as a great uniter of people. The Children’s Football Alliance works with local communities and for local communities which is rare these days of “ticking-the-right-boxes” culture. The Alliance works to achieve tangible results and we believe that a partnership will strengthen both organisations and help empower more communities globally. Q. How will the Peace Fields Project support your work and where will it be applied? FC UNITY’s main remit in Iraq is to provide a platform for conflict resolution and help build peace through the next generations. The Peace Fields will provide a long-term organised programmes for young Iraqis to take ownership and help create national unity. Q. Who are FC Unity’s main participants and how do they benefit? FC UNITY is an inclusive organisation, it about people, from all backgrounds. Primarily our target participants are young people, men and women from the ages of 16. Our aim in the UK is to engage with and empower and bring together minority communities with mainstream British society. Q. What has been FC Unity’s biggest success story to date? Our proudest moment was the TeamIraq – Unity Cup festival in Iraq in May 2009, which was month-long festival with finals over 2 days in Baghdad’s Sh’aab (national) statidum, with over 5,000 young Iraqis coming together. We are also very proud of the 7-year run of the UNITY Cup London, which was never funded (apart from the 2010 event) and provided an opportunity for young Londoners to come together and celebrate diversity.